In my opinion the umpire in the Blue Jays-Angels game on April 24 misinterpreted a backswing interference call that might have affected the outcome of the game in the Blue Jays 2-1 loss. There is a distinction between two types of batter interference covered in rule 6.03 (a) (3) and (4) Comment: For the sake of clarity, I’ll call them Type A and Type B. This is my terminology to establish clarity and not found in the rule book. A batter is out for illegal action when he interferes with the catcher’s fielding or throwing by stepping out of the batter’s box or making any other movement that hinders the catcher’s play at home base. (EX: Batter swings and misses and his momentum takes him into the path of the catcher who is attempting to throw out a runner. The batter is called out and the runner returns to his base unless the catcher retires the runner in which case the out stands and the batter remains at bat. If the batter interferes on strike three and the catcher is attempting to throw out the runner, both the runner and the batter are out. If the batter has his feet in the box and the trunk of his body hinders the catcher’s throw, he can be called out. “If a batter strikes at the ball and misses and swings so hard he carries the bat all the way around and, in the umpire’s judgment, unintentionally hits the catcher or the ball in back of him on the backswing, it shall be called a strike only (not interference). This is also a delayed dead ball. If the catcher throws out a runner who is attempting to steal after he was interfered with by the backswing, the out counts and the batter remains at bat just like Type A. However, if the catcher does not throw out the runner, the runner returns to his base and the batter remains at bat without penalty unless it is “strike three” in which case only the batter is out. When backswing interference occurs the batter is out under three conditions: (1) if it is strike three; (2) if he interferes with the catcher following the backswing interference, or (3) if the backswing or follow-through swing hits the catcher after a ball has been batted and the catcher is prevented from making a play, in which case it is treated as regular interference; the ball is dead, the batter-runner is out and other runners return to the base they occupied at the time of the pitch. With that information let’s see what happened in Anaheim this past Monday night. Devon Travis was batting for the Jays with a 1-0 count in the seventh inning. Chris Coghlan on first base and no outs. Travis swung and missed the pitch and hit catcher Martin Maldonado on the backswing while Coghlan was attempting a steal of second base. Because of the backswing interference, Coghlan was properly sent back to first base but inexplicably, Travis was called out for interference by plate umpire Toby Basner. Bench coach DeMarlo Hale argued the call because manager John Gibbons had been ejected earlier for arguing balls and strikes. It’s possible that Basner judged that Travis interfered with the catcher’s throw such as a Type A situation. But if you look at the video below, that would be a remote possibility. In my opinion, the Blue Jays could have protested the game because this was a misinterpretation of the rules that could have affected the outcome of a 2-1 game. But the protest would have been DOA because Basner also said that Travis stepped across or interfered with the throw which I don’t see. I think you will agree that when you look at the play, Maldonado’s throw to second was not hindered or impeded by Travis after his backswing made contact with the catcher. One member of the Blue Jays staff was under the opinion that Basner added the “stepped across” or subsequent interference comment to cover himself because he had called Travis out which would be a misinterpretation of the backswing interference rule. Another announcer erroneously said, “The batter has the right to the batter’s box. He can stand there and do everything.” This is not true. Although the batter has the right to the batter’s box, he cannot interfere with the catcher’s throw to a base. A batter can still be called for interference while still in the box if he leans over into the path of the catcher while he is making a throw. However, that was not the case in this particular play. It should be noted that you could have conventional batter interference (Type A) following a backswing interference (the ball is not dead) but I don’t think that is what happened here. It appeared that Maldonado tried to sell the call to Basner. The Red Sox and Rays played at Tropicana Field on Aug. 23, 2016. David Ortiz was batting in the top of the eighth inning with one out and Xander Bogaerts on first base. With Bogaerts attempting to steal second, Ortiz swung and missed a 2-2 Brad Boxberger pitch. 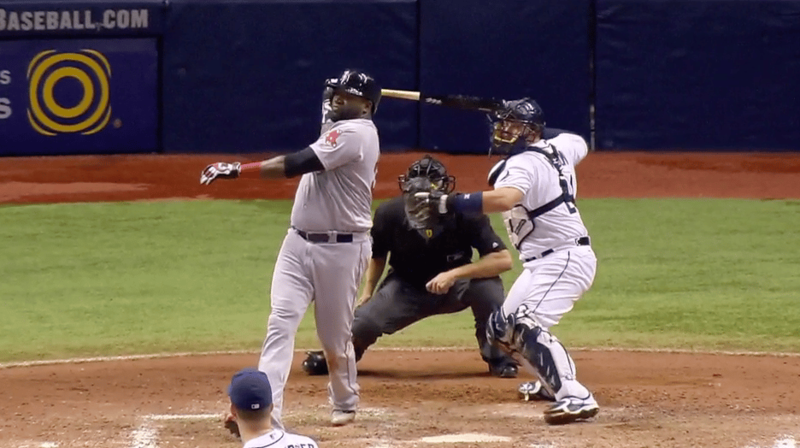 Ortiz’ bat came around and struck catcher Bobby Wilson in the helmet on his backswing or follow-through swing. Plate umpire Ron Kulpa properly called Ortiz out on “strike three” but in my opinion incorrectly ruled Bogaerts out as well. I think Kulpa misinterpreted the rule and over penalized the Red Sox by invoking a double penalty. Only Ortiz should have been called out. And Bogaerts should have been returned to first base. The Red Sox should have remained at bat with a runner on first and two outs. Instead, the incorrect ruling ended the inning. Kulpa, apparently became confused over your typical batter interference when the batter swings and misses and his momentum takes him into the path of the catcher who is attempting to throw a runner out who is stealing. The Red Sox TV broadcasting team was also confused as they supported the call. Red Sox manager John Farrell argued the call but came up empty. From this corner he had a legitimate protest because of the rule misinterpretation. Since the Red Sox won the game 2-1, a protest, however, would have been a moot point.